How do I use "Internet" Custom Tasks in SQL-RD? The Internet module enables you to automate web related tasks. Auto Downloading links, uploading files via FTP, and sending emails can be accomplished here. In the Schedule Wizard, go to Custom Tasks. MAPI (Outlook) address book (Only available if you are using MAPI): Select one or more email addresses or groups. 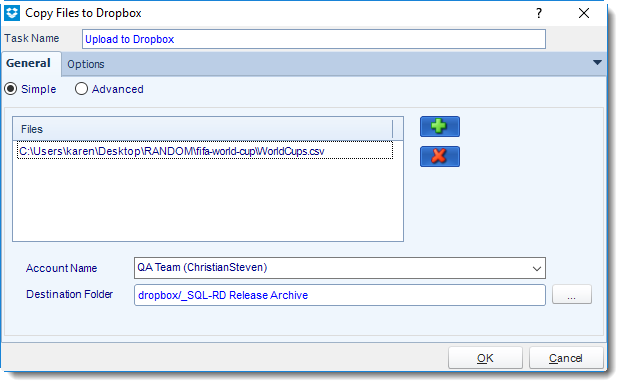 SQL-RD Address Book: Select one or more email addresses or groups. 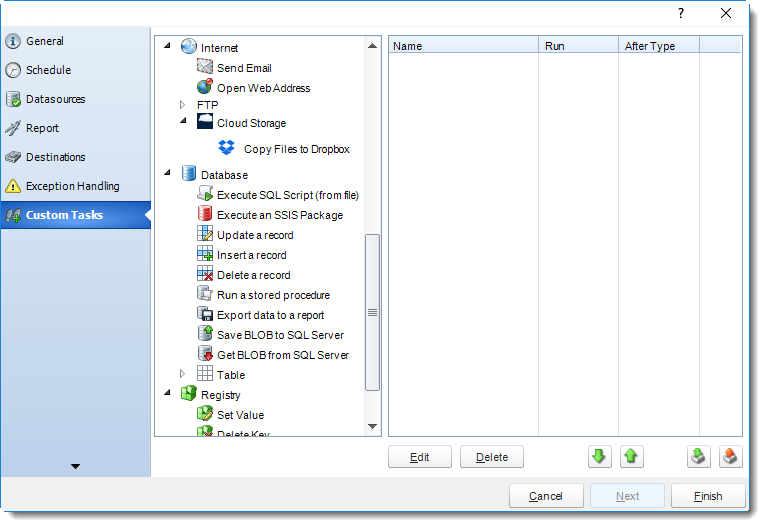 Database Source: Build a SQL query to pick the email address or addresses from a database. Or simply type in the email address. You can use "Inserts" at any time if required. For more information about Inserts, click here. 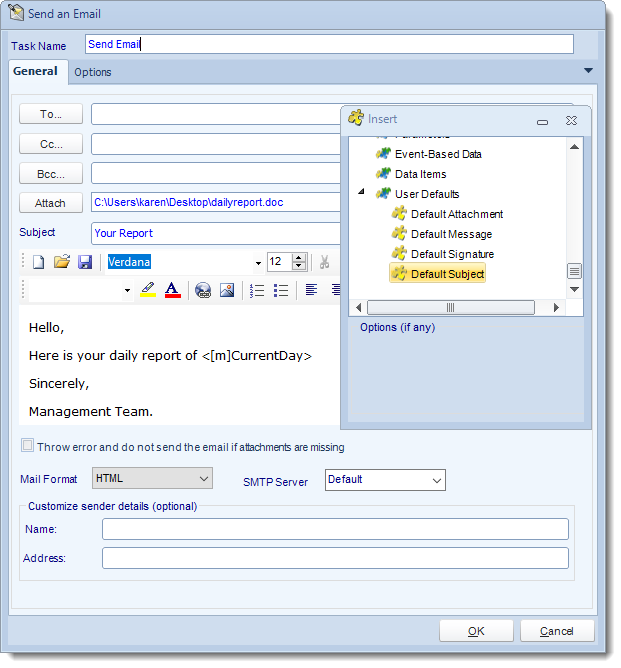 Subject: Enter a subject Or right-click and select Insert to insert constants, database values and defaults. For more information on Insert function, click here. Attach: Click to select an attachment. Or right-click and select Insert to insert constants, database values and defaults. For more information on Insert function, click here. Hint: Web addresses can be attached as well. Body: Type in your email. Or right-click and select Insert to insert constants, database values and email defaults. For more information on Insert function, click here. Mail Format: Choose from HTML or Text. Text Format: In this format it will be just plain message. HTML Format: In this format you can format the message. You can enter HTML tags by click the HTML icon. 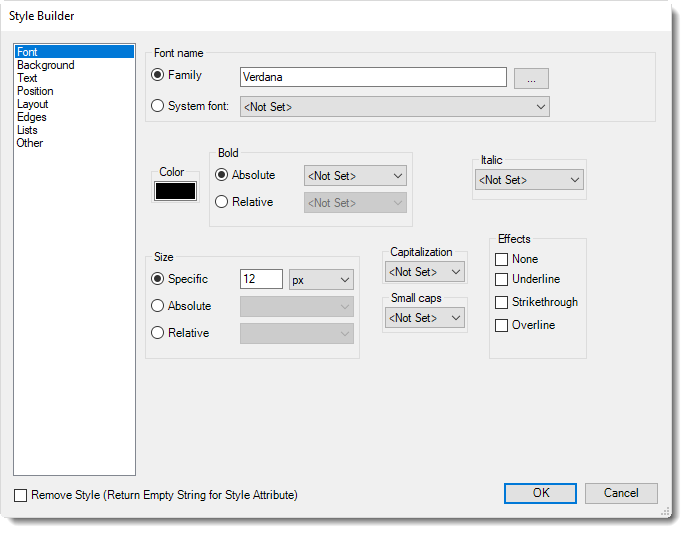 Body Style (CSS): If you want to specify the format that you want, click CSS and you may choose the type of format and change setting accordingly. In this section, you have the option to run this task before, after or you can choose both the schedules executes. Use this task to open a web page. Task Name: Give the task a name. Web Address: Enter the Web address of the website that you want to open. Tip: If you are not sure the full address, click the browse button. This will start your web browser. Navigate to the page you wish. Exit your browser and the page name will populate the field automatically. Download file at URL: Use this option to download a file from a website instead of opening a web page. 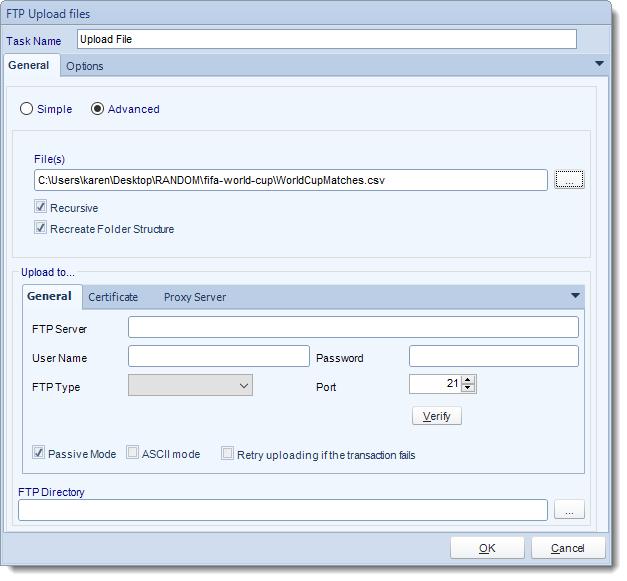 Use these options to upload and download files from the FTP server. Other options available here are to create directories and delete directories. Use (+) button to add files you would like to upload. 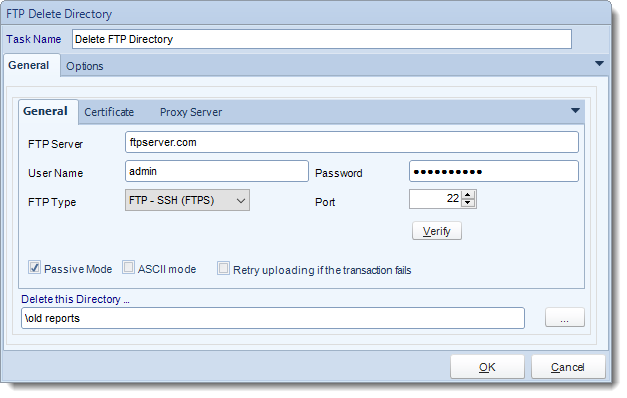 FTP Server: Enter your FTP Credentials. 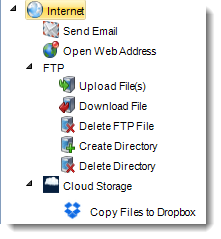 FTP Directory: Click the browse button to connect to the server, navigate to the folder you wish to upload the files to. Use the Advanced view to use wildcards when selecting file(s) to be uploaded. Files: Use the browse button to add files you would like to upload. Recursive: This will search the folder and all sub folders. 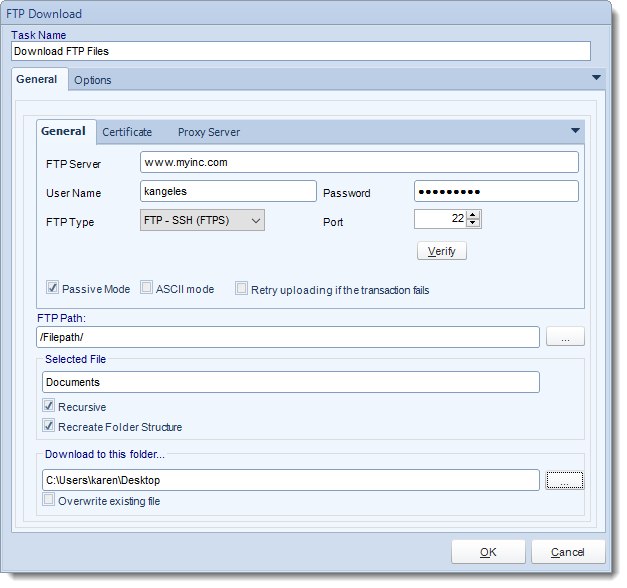 FTP Path: Click the browse button to select the FTP path. Selected File: Select a file or folder or use wildcards to select the files to download. Download to this folder: Specify which folder the files should be downloaded to. Use this task to delete a file on an FTP server. Retry uploading if the transaction fails: this option will retry uploading if the transaction fails automatically. FTP File Path: Use (...) button to navigate to the files that you want to be deleted. Tip: You can right click and insert Constants and database values. You may also use wildcards e.g. my*abc*. 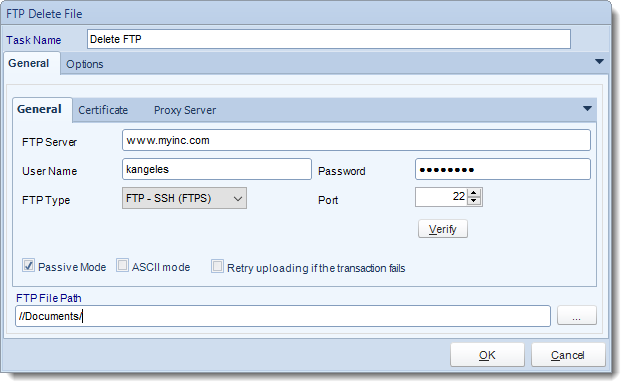 When doing this please remember that most FTP server are case sensitive. 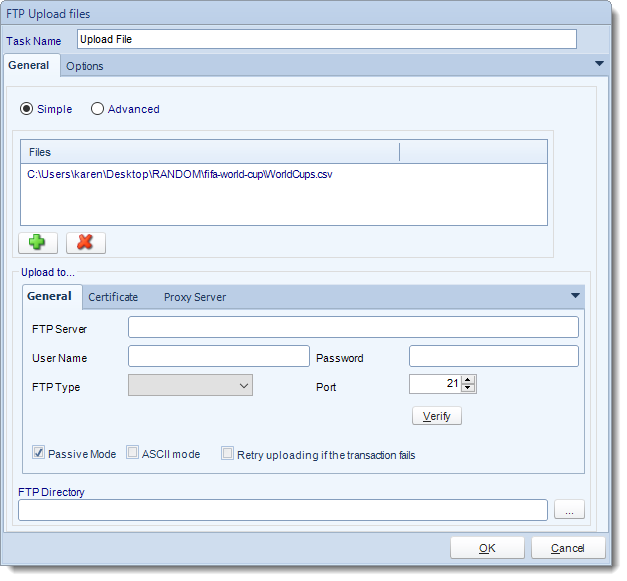 Use this task to create a folder on an FTP server. 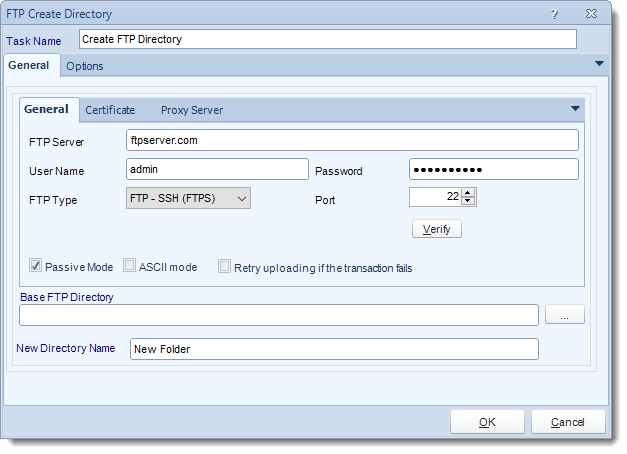 Base FTP Directory: Use (…) button to locate the base FTP Directory. Tip: Leave this empty to select the root directory. New Directory Name: Specify the name of the directory to create. Use this task to delete a directory on an FTP server. Delete this Directory: Specify the name of the directory to create. Add files to your Dropbox account. 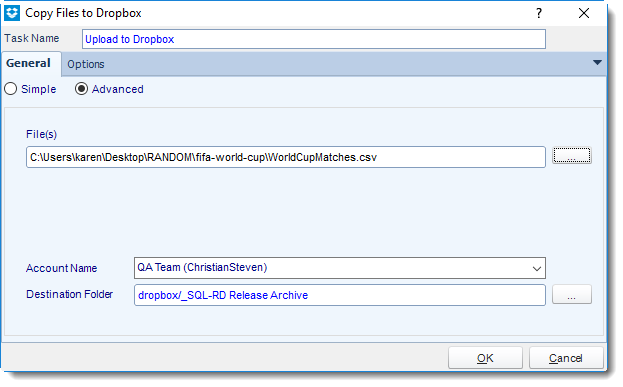 A Dropbox account must be set up in Options settings at Cloud Storage section before using as custom task. Destination Folder: Click (...) to search the destination folder. Use (...) button to add files you would like to upload.